You are here: Home / Throwing Yips / How Do Coaches Handle the Yips? How Do Coaches Handle the Yips? Many coaches try to deny the yips by saying they just have a mechanical throwing problem. Some coaches make the players practice more to make changes, which only makes the yips worse. Now that players are acknowledging they have the yips, coaches understand that not all throwing problems are mechanical. But are coaches handling throwing problems the right way? Retired hall of fame coach, Bob Bennett talks about his personal experiences when he was a catcher and what his coaches told him to do to fix it at the time. Bennett came to learn that his throwing problem was a mental block and not something that can be fixed physically. Coaches will go to what they know: work on mechanics to solve the throwing problem. But this approach can dig players further into a hole – if they have the yips in the first place. When a coach or pitching coach changes a player’s throwing action, they lose some control and consistency until they can repeat the motion intuitively. But this is not ideal if the player’s throwing problem was mental to start. That’s the major confusion because the mental anxiety and tension associated with the yips can alter a player’s mechanics. Coaches see a change in the throwing action and assume that they need to work on mechanics. However, many baseball teams have embraced Sports Psychologists and some have one in the dugout for every game. Mental game coaches are working with players during practice and games so that they can succeed as a team. These players are also getting more help from mental coaches so they can overcome the the yips and regain their confidence and throwing accuracy. Get Yips Coaching with Dr. Patrick Cohn Today! 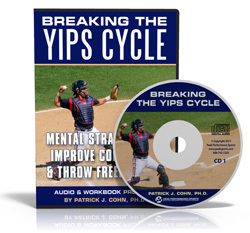 Master mental game coach Dr. Patrick Cohn can help you overcome the yips cycle with personal coaching. Learn how to overcome the throwing yips and throw freely again. You can work with Dr. Patrick Cohn himself in Orlando, Florida or via Skype, Facetime, or telephone. Call us toll free at 888-742-7225 or contact us at for more information about throwing yips coaching! 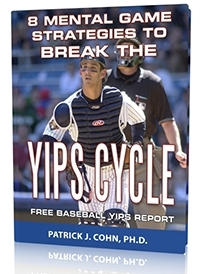 Get Our Free Baseball Baseball Yips Report. Read Other Articles About Baseball Yips.